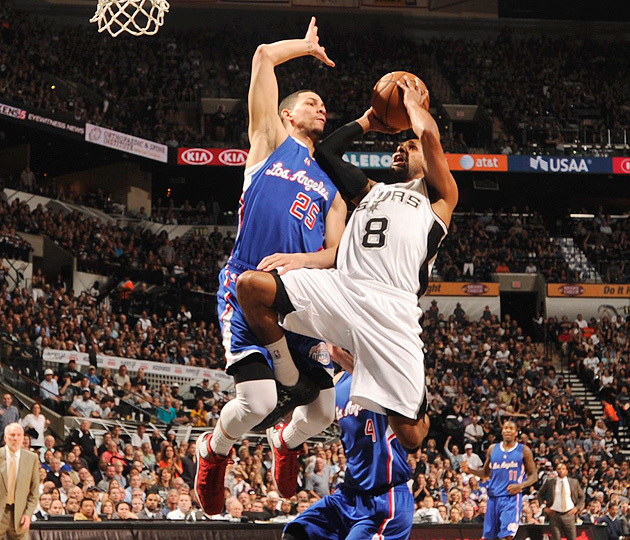 Chris Paul scores 34 points as the Clippers reclaim home court in a 114-105 Game 4 win over the Spurs. The Clippers offered responses on top of responses on top of responses in what can fairly be described as a season-saving Game 4 victory on Sunday. Easily the most important was the return of Chris Paul, who directed L.A. to a 114-105 road win over San Antonio after no-showing in an ugly blowout loss in Game 3. Paul returned to the superb form he showed in Game 1, and he did it facing a unavoidable truth: Although Doc Rivers's roster mismanagement stands ready as a convenient and accurate explanation as to why the Clippers may lose this series, there was no excuse for Paul's showing in Game 3. His final line—seven points on 11 shots, four assists, six turnovers—was one of the worst of his entire postseason career. He had scored fewer points in a playoff game twice (against the Spurs in 2012 and against the Nuggets as a member of the Hornets in 2009), and in both of those cases he had dished at least a few more assists to make up for his misfiring. A superstar of Paul's caliber shouldn't have a game like that in the playoffs, especially in a loss and in a series as tight as this one, but he absolutely can't have two such performances. Paul seemed to understand that from the outset, hitting his first jumper and guiding the Clippers to a confidence-boosting first-half lead. The shellshocked team from Friday was replaced by a much more stable version, with Paul looking ultra-confident and virtually automatic (he shot 9 for 13 from inside the arc, including 5 for 7 on mid-range jumpers near the elbows). [daily_cut.NBA] Paul's 34 points, seven assists and two turnovers was a neat Dr. Jekyll to Friday's Mr. Hyde. He has only scored more points in a playoff game three times in his career, and he maintained firm command down the stretch. In the final period, Paul rocked Tim Duncan back on his heels before crossing over into a pretty mid-range jumper from the right elbow, he lost Patty Mills with a shoulder-shake to set up a mid-range jumper from the left elbow, and he put the finishing touches on the win by nearly making Jeff Ayres fall over before draining another mid-range jumper from the right elbow. This wasn't just a response to a bad night for Paul, but also a strategic response and a little mano-a-mano response between perennial All-Stars. After Spurs coach Gregg Popovich attempted to go to the Hack-a-Shaq strategy, Paul made him pay by repeatedly drawing fouls in the second half. Paul went a perfect 10 for 10 from the stripe, with all 10 shots coming in the game's final 15 minutes. This was part gamesmanship from Paul, who sells calls more regularly than just about anyone in the NBA, and part aggressiveness. His parade to the line left Popovich frustrated afterward. "We lacked a lot of discipline," he said in a postgame interview streamed on NBA.com. "We just gave them six free throws in a row for fouls that were just absolutely meaningless. ... The lack of focus really hurt us in that regard." What's more, Paul owned the fourth quarter despite facing heavy foul trouble himself. Paul picked up his fourth foul with 4:15 remaining in the third quarter and he foolishly committed his fifth foul with just three seconds left in the quarter. With the Clippers holding a five-point lead entering the final period, Rivers faced a tough decision of when to bring Paul back. Ultimately, Rivers held out for the first three minutes of the quarter before sending Paul back into the game with more than nine minutes remaining. "I gave him the one minute [of rest], but it felt like 20 minutes," Rivers said in his postgame interview. "That's a complete gamble, you have to trust the guy." There was an "anything you can do, I can do better" vibe to Paul's stretch run. Remember, it was Duncan who played more than eight minutes with five fouls in San Antonio's Game 2 victory. Here, Paul topped that mark by playing the final 9:03 without fouling out, scoring or assisting on 11 straight Clippers points as the Spurs attempted to mount a rally. The trick, he joked, was to treat his man like a raging bull. "I was playing matador defense," he said in his postgame interview. "I didn't want to give [the referees] a chance to call a sixth [foul]." This wasn't a solo show from Paul, however, and he was the first to acknowledge that. "Game ball goes to Austin Rivers," Paul told ABC in a postgame interview, adding later at the podium: "Without [Austin's] production today, we don't win this game." Rivers enjoyed a nice day in the sun after two-plus years spent toiling in New Orleans followed by three solid months of questions once his father acquired him in a January trade. "The coach's son" and "disappointing lottery pick" is a tough one-two punch to overcome, particularly when your fellow second-unit cast members are often overmatched. Rivers had posted a 10.6 Player Efficiency Rating since arriving with the Clippers—well below league average—and had scored 17 points on 18 shots through the first three games of the series. For whatever reason, he was a new man in Game 4, totaling 16 points on just eight shots. He turned the corner, finished through contact, backed down Mills, pulled up from inside the arc, completed plays in transition and even drew an and-one on Duncan with a pretty, unexpected off-leg runner. Here was Rivers, at least for one night when his jumpers were falling, delivering a response to months of jeers and an answer to Mills's game-changing play in Game 2. San Antonio, for its part, played a mystifying game. In addition to Popovich's concerns about the silly and ill-timed fouls, the Spurs wasted Tony Parker's best offensive game of the series and another good scoring night from Kawhi Leonard by uncharacteristically leaving points on the board. San Antonio shot just 6 for 25 from deep (Danny Green went scoreless in 28 minutes despite six three-point attempts) and missed 10 free throws, including four big misses by Parker in the final period. "We see a lot of things we can fix by just doing it the right way," Duncan said. As the series returns to the Staples Center for Tuesday's Game 5, neither team has fully solidified its identity. The Clippers have won the two games they've played well in, but their inconsistency still looms as a question. The Spurs have been steadier and looked untouchable in Game 3, but they just gave away home-court advantage and clearly have their hands full offsetting the impact of Paul and Blake Griffin when L.A.'s star duo has it going. Once the win was in hand, Paul didn't seem like he wanted to dwell on the turnaround from Game 3. Rivers had gotten on them at a video session on Saturday, he explained, but kicking into gear only after getting an earful isn't sufficient. "The great teams come out like that regardless," Paul said in his postgame interview, already bracing for San Antonio's inevitable response.